Off the coast of trinsic lies a funny shaped, 3 pointed island. Right in the middle was a large white building with no doors inside (there is on there now with the advent of T2A). On the east side was a small white building with no doors but a teleporter behind it that let you inside. Under it was a long passage that ended in nothing (later to become a T2A entrance). It was uninhabited and at the time seemed too large ever fully full up (housing was much less common back them). Arx Draconis was born that day and guild houses began to be placed. A storage shed was placed on top of the white temple building. The Black Eagle squad hall was placed where it stands today and slowly AD grew up. The origonal plan was that the right side would be member houses. The left side would be squad houses. And the southern area would be merchant stores. Little did we know what housing would turn into in this game world. One of our first major purchases for AD was the castle. Likely this is the oldest castle standing in Ultima Online and the first not "dupe gold purchased" castle in existance. On Atlantic shard one castle preceeded it but it was purchased with gold made from using the early "dupe" bugs and was wiped by OSI. Here is a picture of early AD. AD continued to grow over time with the tavern being added and then more squad houses and member houses. 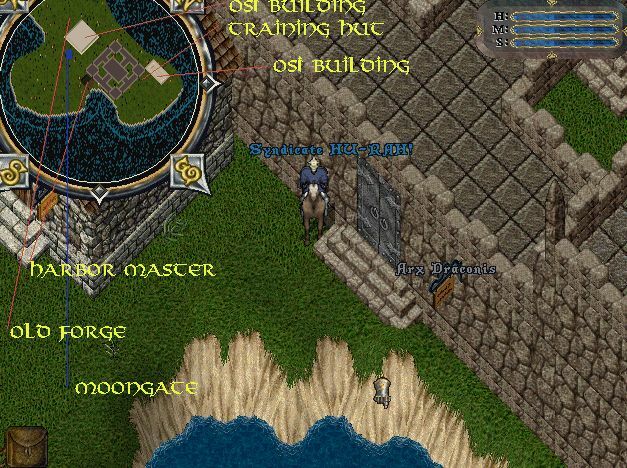 Eventually it grew into what it is today as OSI added in such things as guildstones, vendors, lockdowns and bannings. AD continues to hold the distinction of being the oldest player run town in Ultima Online and arguably one of the best. Arx Draconis is the name of the castle and the name of the island. Its is Latin for 'Castle of the dragons' and sounded real cool to us. Marcellus (our resident Latin expert and first guild quartermaster) came up with the name during our quest for a name. Many were suggested but this one seemed to catch the eye of nearly all members.